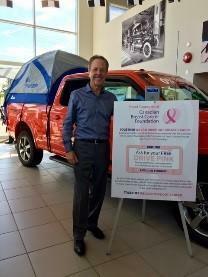 Atlantic Canada’s award winning dealership, Hollis Ford, is creating awareness and raising funds in support of the Canadian Breast Cancer Foundation through the dealers Drive Pink campaign. The dealer is giving away free Drive Pink license plate frames to customers and community members to proudly display on their vehicles. The Drive Pink campaign will be on-going effort to help raise awareness and promote the importance of early screening. Additionally, Hollis Ford will make a donation to the Canadian Breast Cancer Foundation for every new and pre-owned vehicle sold and every customer repair order performed by their service department. Hollis Ford is nationally recognized for excellence in customer service and the company’s ongoing commitment to the community. With an unwavering focus on philanthropy and community engagement, Hollis Ford is helping build awareness on the importance of early screening. The dealer is giving out free Drive Pink license plate frames and has committed to donating a portion of all sales and leases of new and pre-owned vehicles and customer repair order in their service departments. This is one example of how the dealer is heavily embedded in improving communities and fostering positive lifestyles for families in the region. The entire team at Hollis Ford is committed to giving back to the community and places deep importance on the health and wellness of its employees, customers and community. In addition to the Drive Pink campaign the company contributes to several local events and charities which assist in making the community a better place to live, work and play. Established in 1977, Hollis Ford has grown to be Nova Scotia's preferred dealer for automotive sales and service. The dealership is proud to have grown to be one of the largest dealers in the Maritimes. Over the years Hollis Ford has been awarded several consecutive Distinguished Dealer of Excellence Awards along with The Chairman Award for excellence in customer satisfaction by Ford Motor Company. Dealer principal, Rick Hollis has been awarded the MacLean's Magazine Dealer of The Year Award. Hollis Ford is a committed community partner who supports numerous local events and charities.